The Guatemalan Armed Forces consists of the National Army of Guatemala (Ejercito Nacional de Guatemala, ENG), the Guatemalan National Defense Navy (Marina de la Defensa Nacional, includes Marines), the Guatemalan Air Force (Fuerza Aerea Guatemalteca, FAG), and the Presidential Honor Guard (Guardia de Honor Presidencial). The Ministry of National Defence is the agency of the Guatemalan government responsible for the budget, training and policy of the armed forces. Based in Guatemala City, the Defence Ministry is heavily guarded, and the President of Guatemala frequently visits. As of 2014 the Minister of National Defence is Major General Manuel Augusto López Ambrosio. The Minister of Defense is responsible for policy. Day-to-day operations are the responsibility of the military chief of staff and the national defense staff. 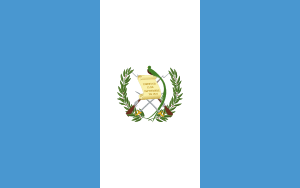 Guatemala is a signatory to the Rio Pact and was a member of the Central American Defense Council (CONDECA). The President of the Republic is commander-in-chief. Prior to 1945 the Defence Ministry was titled the Secretariat of War (Secretaría de la Guerra). An agreement signed in September 1996, which is one of the substantive peace accords, mandated that the mission of the armed forces change to focus exclusively on external threats. Presidents Álvaro Arzú and his successors Alfonso Portillo, Óscar Berger and Álvaro Colom, have used a constitutional clause to order the army on a temporary basis to support the police in response to a nationwide wave of violent crime, a product of the Mexican criminal organizations going across the north-west region. The peace accords call for a one-third reduction in the army's authorized strength and budget — achieved in 2004 — and for a constitutional amendment to permit the appointment of a civilian minister of defense. A constitutional amendment to this end was defeated as part of a May 1999 plebiscite, but discussions between the executive and legislative branches continue on how to achieve this objective. In 2004 the army has gone beyond its accord-mandated target, and has implemented troop reductions from an estimated 28,000 to 15,500 troops, including subordinate air force (1,000) and navy (1,000) elements. It is equipped with armaments and material from the United States, Israel, Taiwan, Argentina, Spain, and France. As part of the army downsizing, the operational structure of 19 military zones and three strategic brigades are being recast as several military zones are eliminated and their area of operations absorbed by others. The air force operates three air bases; the navy has two port bases. The Guatemalan army has a special forces unit (specializing in anti-insurgent jungle warfare) known as the Kaibiles. In 2011, a Guatemalan court convicted four members of the Kaibiles, of killing more than 200 civilians in the Dos Erres massacre in 1982. Each man was sentenced to 6,050 years in prison. Their convictions for their roles in the massacre nearly 30 years prior, in which soldiers killed more than 200 men, women, and children, would not have happened if not for the courage of victims of violence and Guatemala’s attorney general, Claudia Paz y Paz. After the convictions of the Dos Erres four, based on a Guatemalan government’s commitment to reorganize its special forces units, the U.S. Department of Defense resumed military aid. The Armed Forces today number at around 39,000 active personnel. Members of the Parachute Brigade of the Guatemalan army in Puerto San José. 8x AMX-13 (France,ex Austrian army) -status unknown. 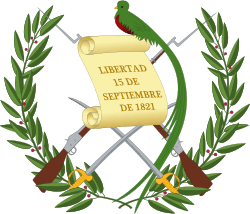 ↑ "Alto Mando del Ejército de Guatemala" (in Spanish). 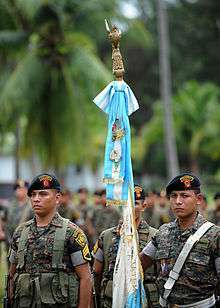 Ejército de Guatemala. Archived from the original on 2014-12-31. Retrieved 2014-01-07. ↑ "Cancelarán 12 mil 109 plazas en el Ejército". Prensa Libre. April 2, 2004. ↑ "Background Note: Guatemala". Bureau of Western Hemisphere Affairs, US Department of State. February 2009. Raul Sohr. ‘’Centroamérica en guerra.’’ Alianza Editorial. México. 1988. Christopher F. Foss. ‘’Jane's tank and combat vehicles recognition guide. ‘’Harper Collins Publishers. UK. 2000.